I've been such a busy bee this weekend ..... lots going on but also managing to chill out and have 'me' time in my craft studio. With my NEW Swirly Bundle still on the table, I just had to make another festive card. 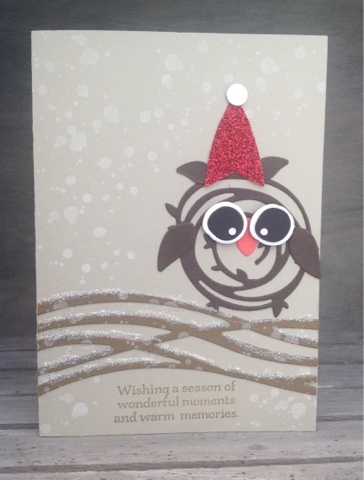 The owl critter I made earlier, just went festive ! Here I added some snow, using the small splatter stamp from the Swirly Birds stamp set, with White ink. Tombow adhesive was dotted along the 'branches' and covered with Dazzling Diamonds Stampin' Glitter for snow. With the triangle punch now retired, I punched a Medium Star Punch in Red Glimmer Paper and trimmed off the right and left points to make a hat shape. The bobble on top used the medium circle from the Owl Builder punch #118074 from Dazzling Diamonds Glimmer Paper. This was my first very simple Christmas Wreath using the largest swirl and leaves die cut in Always Artichoke card and the smallest flower die as holly berries, in Cherry Cobbler. I added a festive greeting from Wondrous Wreath, stamped in Cherry Cobbler ink and a little glitter from Wink of Stella Glitter Brush. 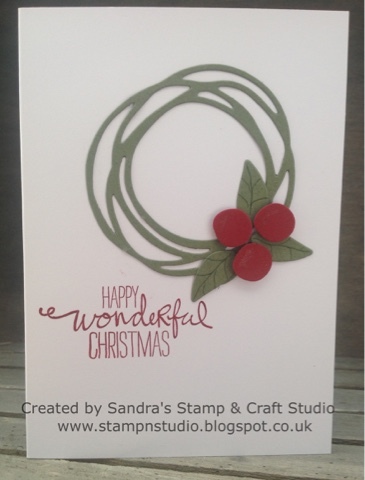 A gorgeous card featuring in my Christmas card club for June. This is such a versatile set. Have you ordered yours yet ? Click on the links below to find out more. DEMO's JUST WANNA HAVE FUN ! 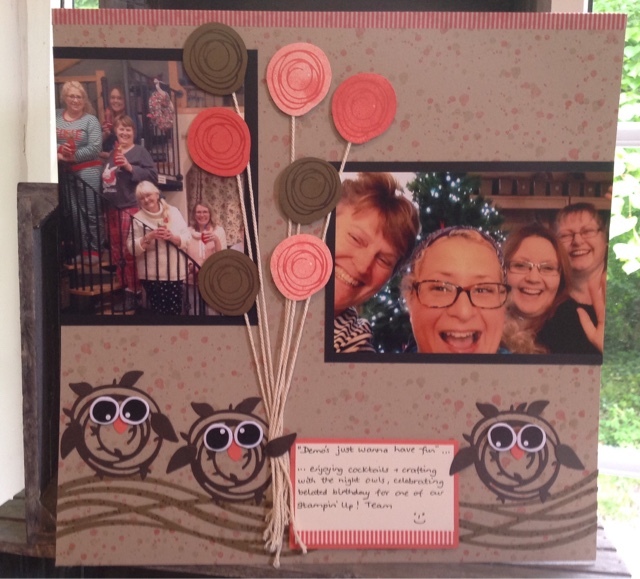 Continuing my suite of projects created with the new Affectionately Yours suite from Stampin' Up!, today I have finally finished the scrapbook page below. I really am quite slack with my scrapbooking but as I had a few photos printed for another project, I added a few extras too. Sitting on the scrapbook shelf, they were in need of some TLC and I am in LOVE with the Swirly Bird stamp set and Swirly Scribbles Framelit Dies. 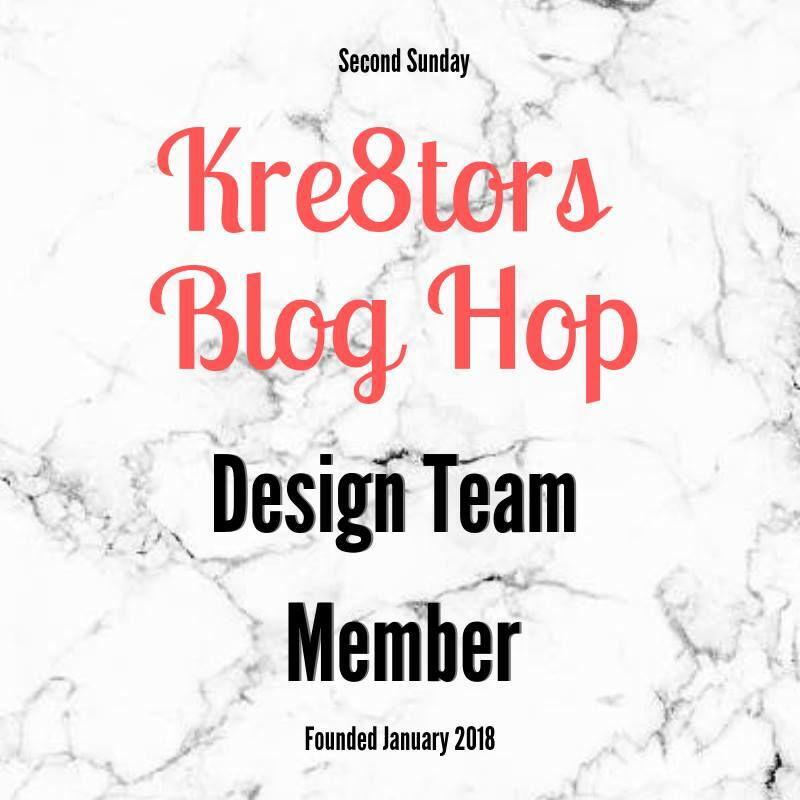 Those who know my Craft Studio, know my love of owls and so when I saw Bronwyn Eastley had made a couple of owl designs, I had to comment on her post and CASE. I have made a few different combinations already. Notice all the small splodges on the background ? This set also comes with its own splodges, which I've stamped off first in both Soft Suede and Watermelon Wonder. Having seen several of my samples created with this bundle, I now have several customers who've added this bundle to their Wishlists, saving 10% buying both together. Please keep popping back, as I'm sure there will be further samples to follow very soon. The NEW Annual 2016/17 is finally here ! 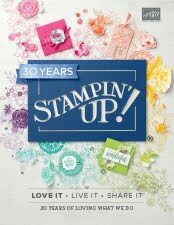 I have added the link to the sidebar but this is from the Stampin' Up! Demo site so doesn't appear to be working for the general public. 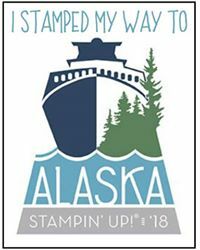 It's so early, Stampin' Up! haven't yet got the links transferred across to our Online Shops (link below) at the moment, but I'm sure it will appear there very soon. 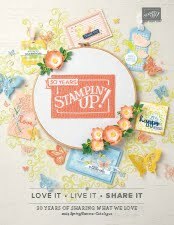 I'm off to work now but will be checking links and get everything fully working this evening, including the fabulous NEW recruitment offer for the whole of June, if you choose to sign up as a Demonstrator ~ on top of the already great offer you can choose an extra TWO stamp sets of your choice, worth up to £92 on top, and still no P&P. Please feel free to message me and I'll get back to you just as soon as I can, but here all evening for you. The excitement is here, especially amongst fellow Demonstrators, but there really is no hurry as this catalogue is here for a whole 12-months. I set my alarm clock for 2am and processed my order and those of the early bird customers who left orders with me. There will be lots of new products to get your hands on hopefully early next week. Finally, if you are free Thursday, Friday or Saturday, I'm having a 3-day 'drop-in' event for you to collect catalogues if you haven't already got. 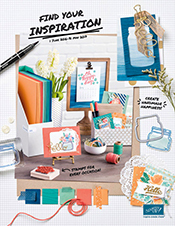 There will be Make & Takes with our NEW catalogue pre-order products and maybe some cake....... a special one for tomorrow anyway, wink, wink. Pop back soon and share that excitement.